Epithelium: salivary gland. Atlas of Plant and Animal Histology. 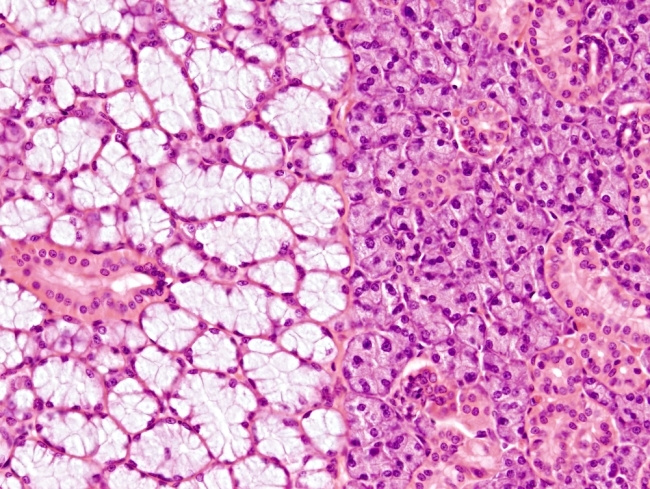 This image is from rat submaxilar salivary gland. Organ: submaxillary salivary gland, exocrine gland. Technique: 8 µm thick sections stained with haematoxylin-eosin. Exocrine glands can be classified according to the type of products they release. Salivary glands are exocrine glands that produce and release saliva. They may contain two types of secretory cells: mucous and serous. 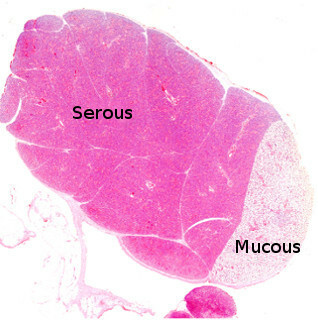 Mucous secretory cells show clear cytoplasm because it mostly contain mucopolysaccharides, which do not retain common dyes, and a flattened nucleus located basal. Serous secretory cells show more dark cytoplasm due to the high enzymatic content, with amylases as the most abundant enzymes. The nucleus is located in a central position and is rounded in shape. Myoepithelial cells, showing a narrow cytoplasm and a very flattened nucleus, can be found around excretory ducts and some acini. 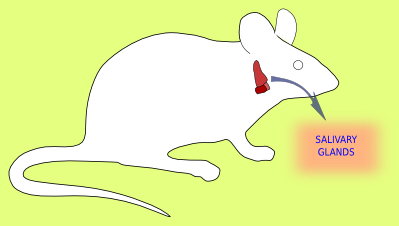 These cells can make contractile movements, which help to expel the gland content. In humans, there are several salivary glands: parotids, sublingual, submaxilar and some other small glands known as accesory salivary glands. Only sublingual and submaxillary are mixed glands (with serous and mucous acini), whereas parotid is only serous. The minor glands are mucous. Whatever the type of salivary gland, all of them release saliva to the oral cavity after stimulation by the autonomic nervous system. Types of acini: mucous, serous and mixed. 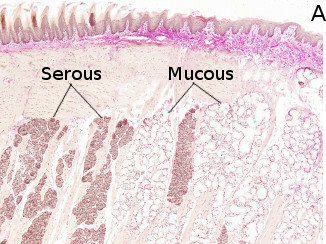 Mixed glands have separared mucous and serous acini, but some glands may have serous and mucous cells intermingled in the same acinus. The serous demilunes on the right (bottom part) are observed at light microscopy but they are actually artefacts. (modified from Krstić, 1989). Parotid salivary gland of a rat. 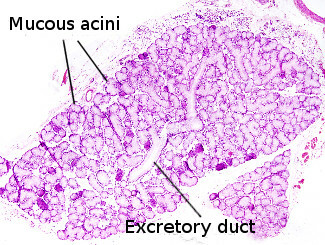 Mucous acini and excretory ducts can be observed. Sublingual salivary gland of a rat. Serous and mucous acini can be observed. Sunmaxillary salivary gland of a rat.The serous part is located on the left and the mucous part on the right.